James Birchal - Chef James. It’s a culinary conundrum faced by food lovers everywhere: You want a nice meal but are too busy to cook or spend the evening in a restaurant.... and a takeaway just won’t do. Enterprising Peterborough chef James Birchall thinks he has come up with the answer with the launch of his new business Chef James. Working out of the kitchen at his Hampton homes, James, who has an impressive CV, prepares restaurant quality meals, to order, and delivers them to you door. All you have to do is heat it up... and enjoy. The classically trained chef (he left home at 16 to follow his dream) has worked at the likes of Langans Brasserie Mayfair and for the Harvey Nic’s chain. He has also had the privilege of cooking for Prince Charles on several occasions at Clarence House and Sandringham. And if he is still short of ideas, most recently he was head of innovation and development for a large global food business. “My dream has always been to have my own business,” said James. 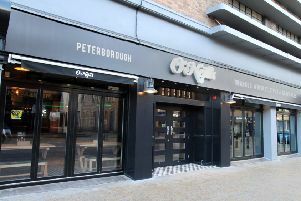 “From speaking to people and from the market research I carried out, I saw a real opportunity here in Peterborough. “My overall purpose of the business is to offer healthy, fresh, on trend chilled restaurant quality meals where I deliver them to your door. The chef, who makes his own spice blends and marinades as he creates all his dishes from scratch, feels this gives him the edge. “I believe this is critical and something I am very passionate about, I think the choice our local community has is generally unhealthy, expensive with limited choice,” he added. James now takes orders and delivers across the whole of south Peterborough as the customer base for his modern take on ready meals continues to grow. South East Asian and Indian are proving his biggest sellers, with pies now becoming popular as winter sets in. And not one to rest on his laurels, James is working towards opening a deli and a bespoke experience evening cookery school in the city centre.